As usual, last minute posting! Hopefully this time it's better than the savagery of the Globes predix for me. Added my friend Griz's predictions in purple. To the death! (Actual results will be in red). (Also: I realize I have the same picture up but I'm too lazy and tired to change it now. Edit: I've changed it to the surprise horse, Phantom Thread). There are a couple of films that could replace what I've selected here, namely Darkest Hour in place of The Big Sick or The Florida Project. I feel like the Academy may lean American, and sight unseen, Darkest Hour sounds dreadful. I'd love for Blade Runner:2049 to get a nomination here. And I may vomit if Wonder Woman gets in, which it very well can given the PGA nomination. Martin McDonagh – Three Billboards P.T. Anderson - Phantom Thread! Wowza. I feel like going with the DGA on this one. On the off chance that people actually saw Phantom Thread, P.T. Anderson could sneak in. But Spielberg's The Post is very rousing and liberal, people may wanna reward him just for making it. I think this category is set. Alt. Denzel Washington – Roman J. Israel, Esq. I don't know how much the allegations are going to affect James' chances, considering the timing of the voting closed just a day after the allegations became news. If I had thought that James Franco deserved, as an actor, his place on this list, I would feel sorry that unproven allegations cost him the rightful nom. Having said that, he's not be on my list of noms so I would not shed tears should he get left off. Denzel could sneak in, not Tom Hanks (he got out-acted by Streep). Holly Hunter – The Big Sick Lesley Manville!! The SAG clip I saw of Hong Chau's performance featured a lot of crying, so I'm putting her in. I dislike the idea of Mary J. Blige getting a nomination for Mudbound, having seen the film. I wonder if people just want to give awards to famous names simply for showing up and not screwing up. It's not even subtly fabulous, like Dafoe. It's a non-event. I also don't understand Octavia Spencer's buzz here. I wish Lesley Manville would snag a surprise one here. This may mean I'm racist after all. Will we have a political vote here for Plummer? Not saying that he doesn't deserve it (I haven't seen the movie), just saying it may have the extra current sauce on. And will Three Billboards pull all three possible noms? I'd say yes based on the support shown for the film so far. I think the Academy may want to reward the Big Sick here with a nom, but it's a shakey bet. I'm not sure whether I, Tonya (backed by WGA) or The post (backed by current climate good will) would sneak in here. My wish is for Phantom Thread to sneak in. Is The beguiled a wishful alternate? A hundred times yes. I have a hard time believing Logan would get a nom over the tour de force The beguiled, but ... WGA nom! In the fade On body and soul!! I've seen On body and soul (short listed) and I'm surprised it's there because it's an odd duck. I'd love for it to be included though! I've only seen Coco, unfortunately, so these are really blind guesses. I can't bear the thoght of "Boss Baby" being an Oscar nominee. I'm not sure about The shape of water, but if it's a second front runner, it needs this nom. I'm just going by what the guild nominated. I don't understand Mudbound cinematography nomination over something like The Beguiled. PT Anderson loves his set, so I'm hoping its flashiness prevails (though the guild didn't think it was all that, strangely enough). I have nuthin' to say here. Wonder Woman, if it should show up, should probably show up here. Sound has always been confusing. How can contemporary work get a nom here? Outside of Dunkirk, I can't remember any of other pictures' score. 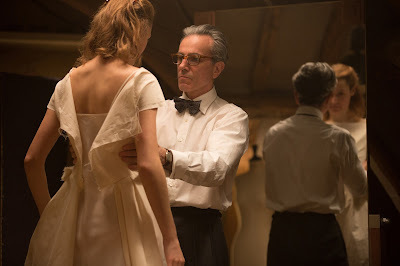 Though, Phantom Thread's score was very much part of the film so it should be here. I totally looked up Marshall. The results are in! You got 84 plus 7 and I got 84 plus 5 alts! A close shave! I think we did pretty well on the whole, a lot of aced categories. Definitely not one of the tougher years to predict, certainly not one of the more surprising ones except for PTA and his Phantom Thread overperforming! Still, it didn't feel like there were any particularly cruel snubs either (The Post's omission is puzzling though). I saw The Post, and I could see why it missed out; perhaps a little too 'let's round up the troop' from Spielberg? I'm pretty proud of the ones we aced on - let it be known time and brain cells were spent on this FOR NO REWARD BUT SELF SATISFACTION. Imma have dis.